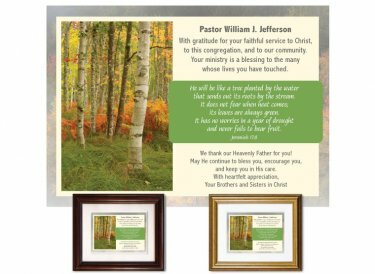 Lovely appreciation plaque appropriate for any member of the ministry team, featuring this verse from the 17th Chapter of the Book of Jeremiah: He will be like a tree planted by the water that sends out its roots by the stream. It does not fear when heat comes; its leaves are always green. It has no worries in a year of drought and never fails to bear fruit. The image was made at Sier de Monts - Acadia National Park, Maine. You''ll personalize it with clergy's name and your special message. Framed & Finished - Printed on premium paper with archival inks and double-matted with conservation-grade matboard as above; mounted using acid-free foam core backing; framed using distortion-free UV acrylic glazing. A protective dust cover and wall guards are applied to the back. Your choice of walnut, gold or black wood frame (view frames here); ready to hang. Finished size: 10"x12"